A true Indica, Amsterdam Indica marijuana strain has a very famous pedigree – its parent plants are Northern Lights and Afghan. Amsterdam Indica is a short plant that manages to produce good yields,it has a moderate to high THC count and moderate CBD and CBN counts, which give the Indica-specific effects when used. Because Afghan was one of the strains used to produce Amsterdam Indica, this cannabis plant can be easily grown even by inexperienced growers. Its short stature makes it a good plant to manage in an indoor growing environment. Because it’s a 100% Indica, Amsterdam Indica marijuana plant shows the traits you would expect from an Indica, like short stature, stockiness, and wide and rounded leaves. It’s not uncommon to have a 20 inches tall Amsterdam Indica plant, or even shorter, which makes it even more surprising when the time to reap the fruits of your labor comes, and the small plant delivers a very good amount of buds. 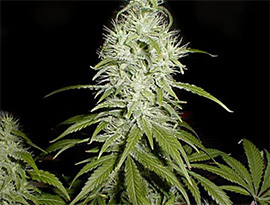 Amsterdam Indica produces sticky flowers with white hairs, grouped in large colas. Amsterdam Indica’s scent is hashy, but the taste has a distinct citrusy and fruity aroma. Because of the medium to high THC count, 15-20%, and the formidable CBD and CBN count, around 0.36% and 0.39% respectively, it produces a body stoned feeling which is strangely high. It might not be the best sort to be taken early in the morning, or during the day for that matter, because it’s likely to leave the user feeling sleepy and relaxed. That makes Amsterdam Indica a good marijuana strain for people who have troubles with insomnia or anxiety. Amsterdam Indica got the very best from its parents when it comes to ease of growing it. It has the mold and disease resistance of Afghan, but also the ability to be grown outdoors in colder climates of Northern lights. It’s a very resilient strain of cannabis, so it can really take a beating and still be able to bounce back. Over-nutrition is something growers should look out for, but even if it happens, the plant can recover from nute burn. It grows well on hydro and soil alike, and is a great choice for first-time growers. Anyone who wants to buy cheap Amsterdam Indica seeds can easily find them online. Several different seed shops and growers have it in their inventory, and they’re only a quick search away at any time. When buying Amsterdam Indica seeds, you should make sure the shop you want to buy from offers shipping to your country.